It's been a whirlwind couple of days for Tiger Woods. On Sunday, he won the Masters for the first time since 2005 while capturing the fifth green jacket of his career. 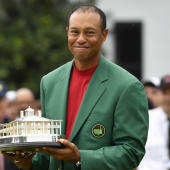 On Monday, to follow up on the victory, Woods apparently had a call with Donald Trump, who revealed that he'll be honoring Woods' miraculous comeback and Augusta win with the Presidential Medal of Freedom. Woods reclaimed a spot at the top of the golf world with his win on Sunday, and it's carrying on into the week. President Trump had nothing but congratulations for Woods after the historic win on Sunday. Trump, who is known to golf with Woods from time to time, said that the pair spoke on the phone on Monday and he'll be presenting Woods with the aforementioned award in the near future. Woods, of course, has battled numerous injuries and obstacles off the course in his quest to get back to the top. He will join the likes of Arthur Ashe, Muhammad Ali, Billie Jean King, Michael Jordan, Jack Nicklaus and Arnold Palmer as athletes to receive the award. Woods, of course, will continue his pursuit of Nicklaus' 18 major championships, but the award is a great honor for someone who has battled back from a long way down to get back to the very top.